If anything can add to the allure of a camping holiday in stunning surroundings, then it is enjoying the type of spaciousness that ensures complete relaxation, and Chàteau de Galinée provides both. Endless stretches of golden, powdery, beaches allow everyone the space to unwind and soak up the wonderfully rejuvenating spectacle that is Northern France. LUX-camp will ensure that the mobile home accommodation at your holiday camping site provides the camping luxury necessary for a truly memorable camping holiday. Acres of beautifully landscaped gardens. Luxuriously spacious and well-fitted mobile homes. Recreational facilities for the entire family. Renting a mobile home situated in the Chàteau de Galinée luxury camping site allows a refreshing taste of the unique atmosphere of French country living. Complete with an imposing manor house, each mobile home in this well-designed luxury camping site is set amidst the park-like surrounds that maintain the authentic feel of rural France. A mobile home booked via LUX-camp is the perfect place in which to relax and replenish energies lost during a day of fun activities in the water complex, or exploring the nearby treasures of St. Cast. The aquaparc at Chàteau de Galinée provides as much for swimmers as it does for those wanting to laze on a comfortable sun-lounger shaded by a colourful parasol. 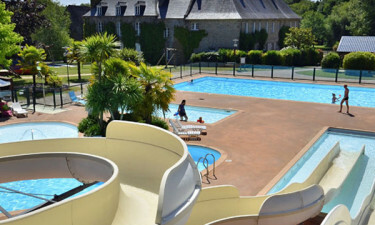 A large pool encourages some serious swimming, while a lake pool offers massaging water jets in a short river section. Paddling pools cater for the younger visitors, while water slides promise to keep the fun and adrenaline flowing for all. St. Cast is a mere stone’s throw away from the luxury camping site of Chàteau de Galinée, which means easy access to the exceptionally beautiful Emerald coast. Apart from its stunning beaches, the area offers cycle, mountain bike and walking trails for avid adventurers to explore the history and raw beauty of the Emerald Coast. The on-site bar-restaurant at Chàteau de Galinée is the place to kick back and relax with family and new-found friends and enjoy typical Brittany cuisine, drinks and entertainment. 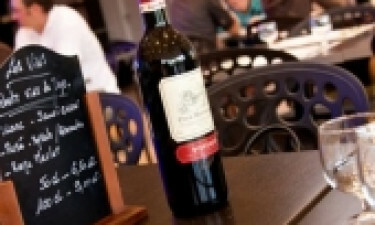 Seasonal themed evenings promise music, food and plenty of laughter in large, open-plan and very welcoming surroundings. However, the pervasive holiday atmosphere guarantees year-round gatherings filled with warmth, friendliness and, above all, fun. An on-site shop provides most of the provisions necessary to stock the larder of a mobile home, as well as offering warm, mouth-watering breads and pastries for a breakfast wholly in keeping with what is expected from luxury camping. Brittany is renowned for its oyster and mussel production, and local restaurants offer these fresh from the sea. The area is also famous for its sweet and savoury pancakes. 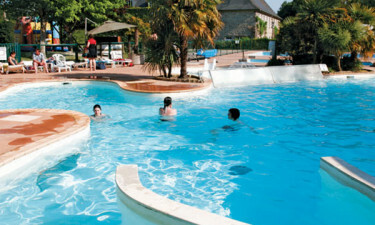 LUX-camp is confident of the all-round appeal of a holiday camping site like Chàteau de Galinée.